Leimkuhl started her career as a telephone operator right after she graduated high school in Wichita, KS. When she married Dean Leimkuhl from the area, she moved to Webster in 1967 and continued working as an operator. “I enjoyed my work,” she said. Over the years, Leimkuhl says she saw a lot of changes to the communication industry, not to mention the changes she’s seen after she retired. Leimkuhl has a cell phone, but she says it’s nothing fancy and she only uses it for trips out of town. 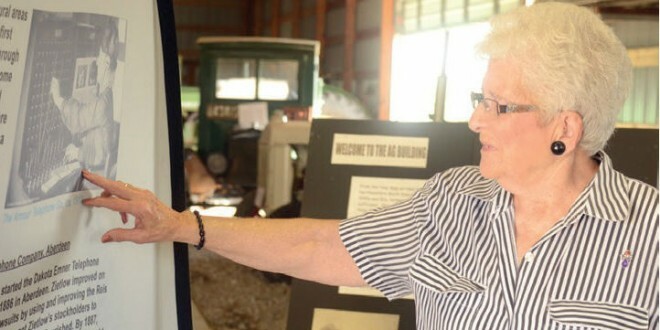 Today, Leimkuhl resides in Waubay, but remembers her years working at Northwestern Bell Communications in Webster well and spent time Aug. 26th reminiscing at the Museum of Wildlife, Science & Industry at the traveling South Dakota Communicates exhibit. There have been many changes over the years, Leimkuhl says. From the elimination of a four-party line system to the introduction of dial phones, and from doing away with overhead cable lines to putting in underground fiber optic cables. “One of the big changes was dialing to make a call,” she said. The introduction of touch-tone phones was also a major shift towards modern communications. Party lines were more or less gossip lines, Leimkuhl said, since anyone on the line could hear all conversations that took place on that line. When she was hired at Southwestern Bell Communications as a high school graduate, Leimkuhl says they taught her the proper operator procedures on the job. “They just sat us down to a switchboard and taught us how we were to answer,” she said. In Wichita, there were 400 telephone operators on staff and as many as 1,500-2,000 calls a day would come in. But in Webster, there were only eight people on staff and the workload was somewhat lighter, with only an average of 100 calls a day coming in. Operators were responsible for keeping track of call times and billing for each of the long-distance calls. Telephone operators had to cover night shifts, too. The differences between Wichita and Webster were also something to get used to. When there were typically 40 people on a night shift in Kansas, here, Leimkuhl often worked solo. The biggest and Leimkuhl’s favorite difference between working at the two locations as a telephone operator were the people. The building in Webster that Leimkuhl ran a switchboard from is still being used as a telephone office today. In the case of an emergency telephone call, Leimkuhl said she would flip a switch from inside her office that would turn on a light on top of the hotel in town. When emergency personnel saw that, they knew to call the operator and get instructions. Leimkuhl remembers a bad storm during the winter of 1968-69 when heavy ice buildup knocked down many lines in Day County, cutting off communication for much of the area. “We had to come in to the office early and dispatch crews to the areas where lines were down,” she said. It was the operators’ jobs to find out where lines were down by discovering who they could connect with and who they couldn’t through the switchboards. “In some places, they had to set new poles and in others, just knock ice off the lines,” she recalled. After that experience, Leimkuhl says she sees how underground fiber optic lines are beneficial. In 1970, the telephone companies did away with the position of telephone operators. “The elimination of the operators was a sad time for everyone,” she said. When that happened, Leimkuhl was given the job of service assistant. In 1973, she was promoted to manager.